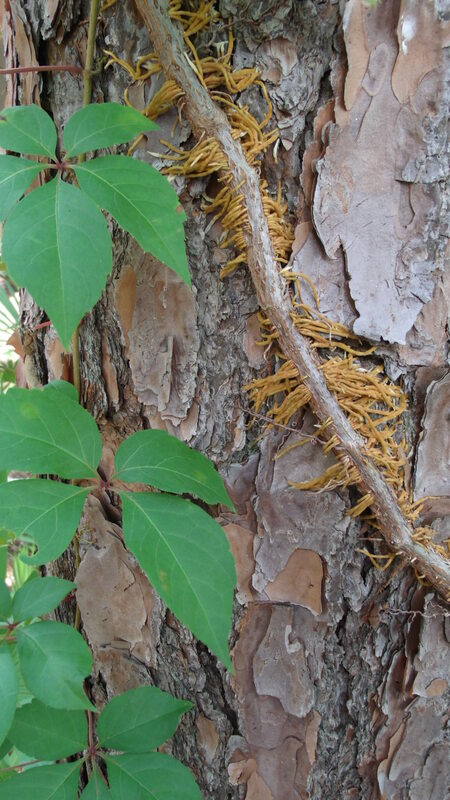 I ventured into my “backyard” (or whatever you call the outside of your apartment) to do a little picture taking, and these pictures are some of my favorites from the stroll. I’m fortunate that I open my eyes every morning to a view some would kill for. 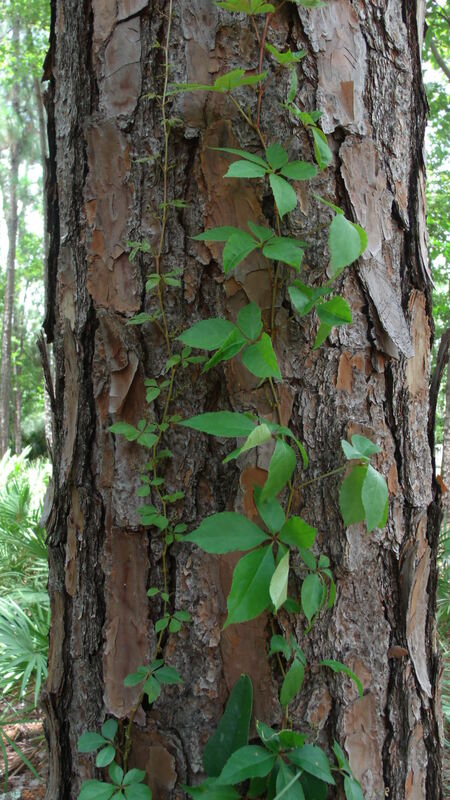 I peer through the vine-covered tree trunks and see a pond. The palms grow in patches at the feet of the trees, and occasionally the wildlife draws me outside for a closer look. I often think that what I see everyday is photo-worthy, and I’ve made good on that thought a few times. It’s summer now, and the turtles happily cruise the pond and sometimes wander towards even the parking lot during their carefree days. If you walk out onto the dock, you’ll see them swim towards you, hoping for a handout of breadcrumbs or other snacks. For such a slow mover, the turtles sure move fast in the water when they want to. 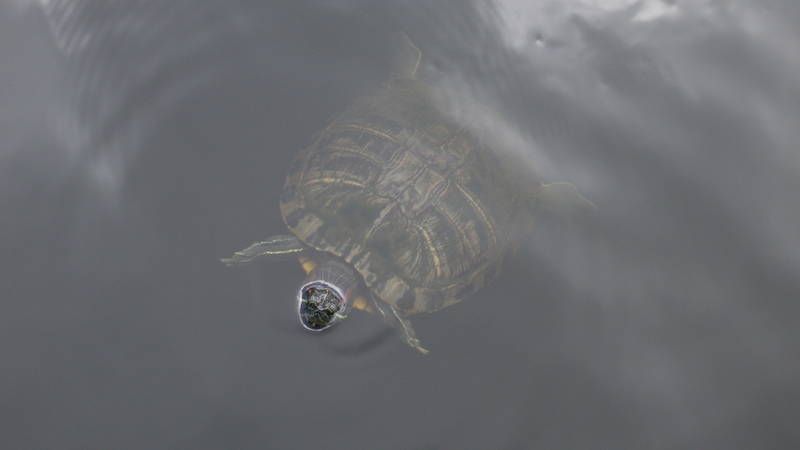 Some small fish also gather to beg – which leads me to believe that a resident often makes their way out to the dock to give the turtles a special treat. On the legs of the dock and long woody stems of aquatic plants that jut out of the water, pink columns seem to “grow” above the waterline. 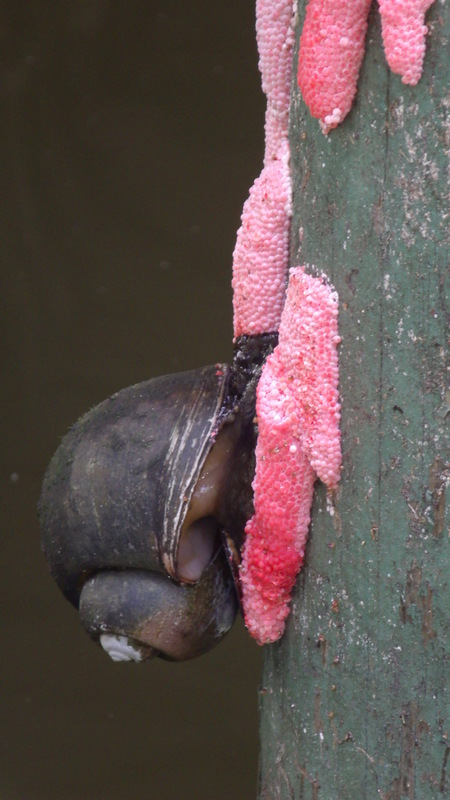 A closer look reveals a clutch of eggs, and a giant apple snail laying a late-season clutch. The eggs are everywhere. Anywhere they can lay them, they do. 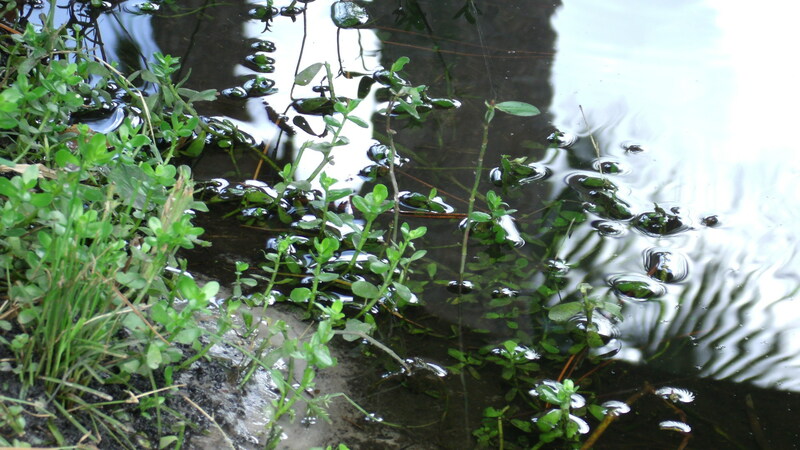 And in some time, more baseball-sized snails will patrol the pond. 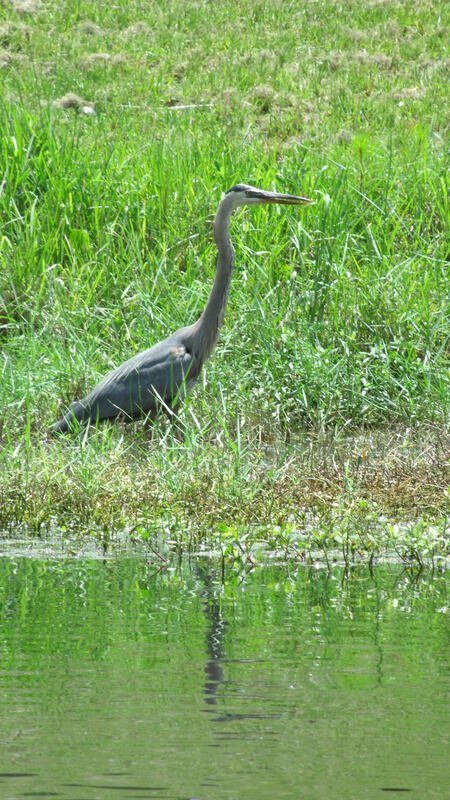 A Great Blue Heron slowly stalks the bank, looking for his next meal. Probably some small fry that enjoy the warm water close to the bank. Still as a pole, the heron moves slowly in the grass, striking quickly when its prey is within reach. I’ve seen ducks, Canadian geese, Snowy egrets, cardinals, vultures, and many other varieties of birds in my neighborhood. Florida is surely a state “for the birds”. Frogs serenade the night, loudly on more humid nights, and sometimes you’ll find them sticking to the windows and peering into your home. There are some even as small as a fingernail that hop through the grass in the evenings. Lizards, particularly anoles, peruse the palm leaves and climb the stucco of my building. Curious and personable, these guys show little fear of humans. 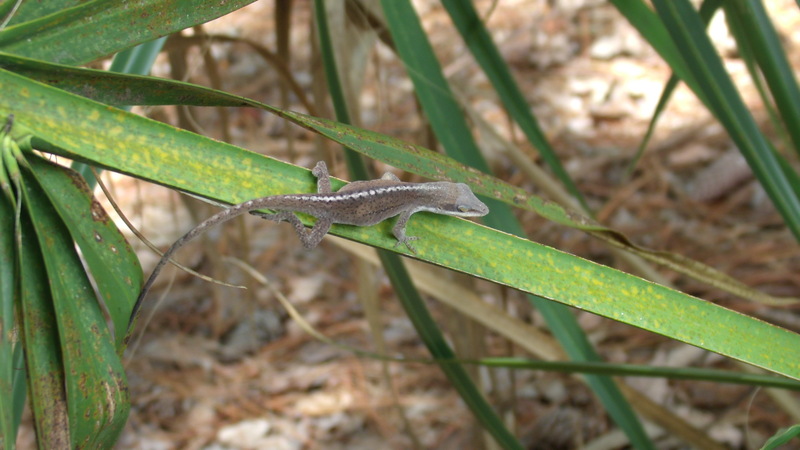 I’ve seen skinks, including one variety with a rainbow-colored tail. I’ve yet to stumble upon a snake, and I’m thankful for that! When I was younger, I ventured outside and could tell you all about the critters that lived in my neighborhood. I wouldn’t have known the variety of creatures that dwell in my picture-perfect view if I never ventured to take a closer look. I’m sure my big backyard has more secrets to share with me down the road. Who doesn’t love puppies? I mean, they’re pretty much the most irresistible thing in the world. I’ve painted a few of my favorite breeds today, and here they are for you! One of the most irresistible puppies to a lot of people is the French Bulldog. With their wrinkles and wide set eyes, they’re so ugly they’re adorable. And, they have great personalities. 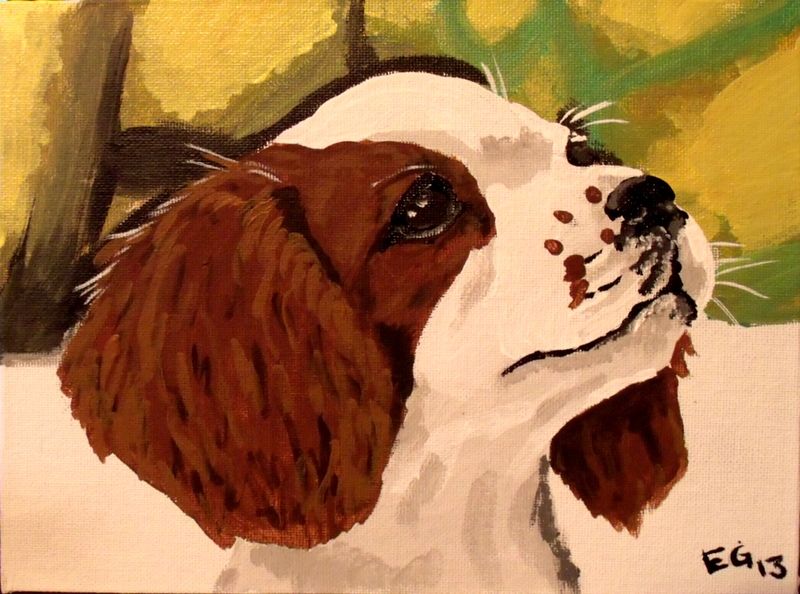 Another one of my favorites, the Cavalier King Charles Spaniel. A smaller spaniel, they’ve got all the cuteness of spaniels bred into the cutest, softest little package you could get. They’re spunky and adorable! 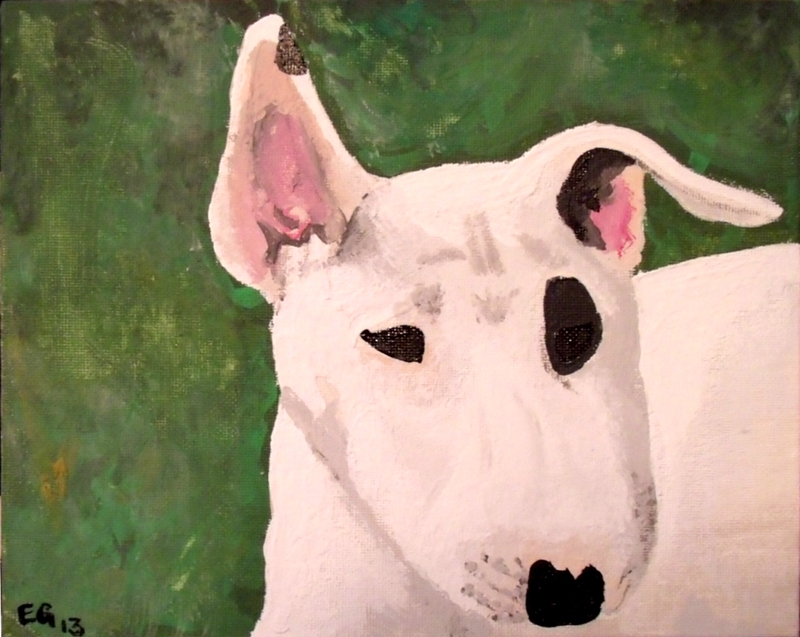 Lastly, I’ve painted the English Bull Terrier. Made famous by Target, this breed has a uniquely bowed “roman” nose, and they’re very sweet little cuddle bugs. Very strong and sweet cuddle bugs! I’ve always loved dogs, and I imagine they’ll be the subject of a lot more art to come. I hope you enjoyed! All three of these pieces are available for purchase at my Etsy Shop. 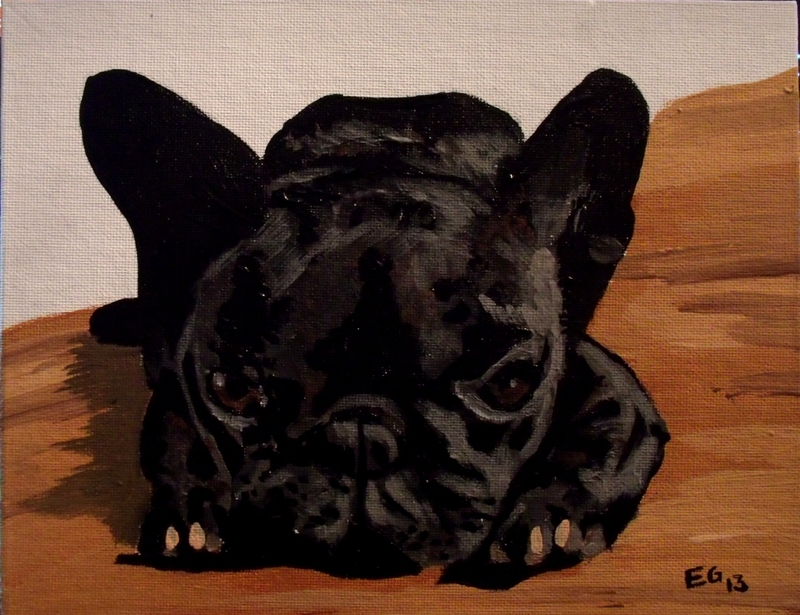 This entry was posted in acrylic, adorable, animals, art, bull terrier, bulldog, canine, cavalier, cute, dogs, for sale, french bulldog, painting, portraits, puppies, spaniel, Uncategorized and tagged acrylic, adorable, animals, art, bull terrier, bulldog, canine, cavalier, cute, dogs, for sale, french bulldog, painting, portraits, puppies, spaniel on June 18, 2013 by Jumping Jack Studios. One of the more inspiring things about life is its ability to bounce back. When we get knocked down, we get back up. 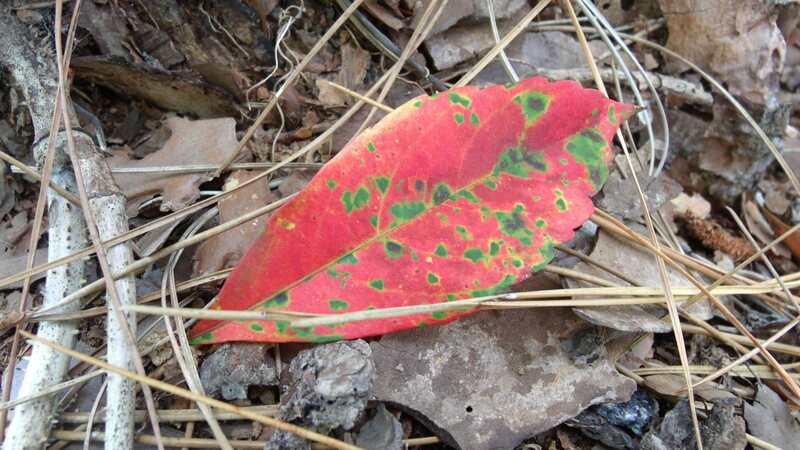 When a fire burns through the land, new life sprouts from the ashes. We regrow. We rebuild. We reinvent ourselves when failure inevitably comes knocking. 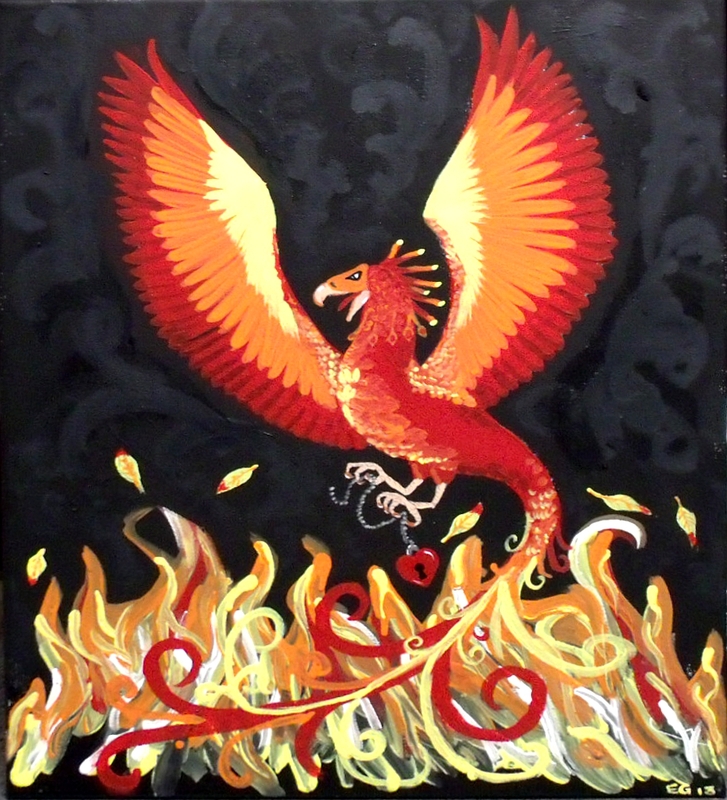 This particular painting is of course, of a phoenix, emerging again from the ashes in an explosion of fire. It symbolizes, for me, reinvention, adaptation, and new beginnings. 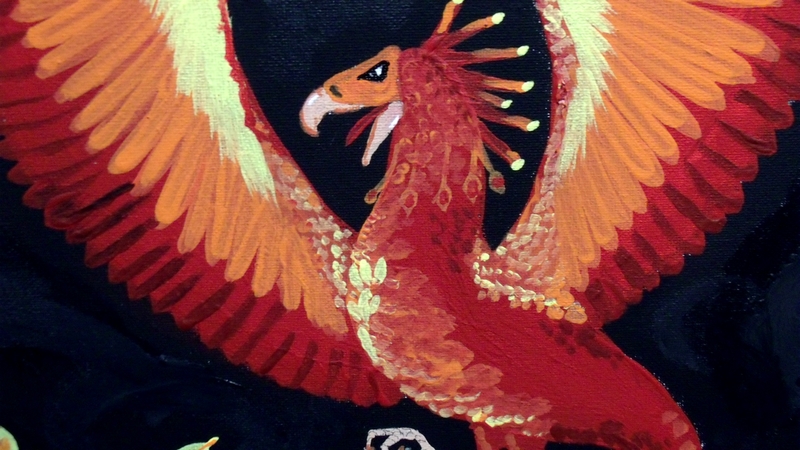 It was painted for a friend, whose son’s name is an alternate spelling of the same word:phoenix. He’s probably the closest thing I’ve known to a kid of my own, and I miss him and his family dearly! This entry was posted in acrylic, animals, art, ashes, bird, black, fantasy, feathers, fire, flame, heart, mystical, painting, phoenix, rebirth, red, Uncategorized and tagged acrylic, animals, art, ashes, bird, black, fantasy, feathers, fire, flame, heart, mystical, painting, phoenix, rebirth, red on June 10, 2013 by Jumping Jack Studios. The Burrowing Owl, as its name suggests, lives in holes in the ground in mostly desert/prairie ecosystems, though it’s also found here in Florida (I’ve yet to see one…but I haven’t been looking). If there is one thing I have to say about Florida, it’s that it is chock full of birds of every feather. 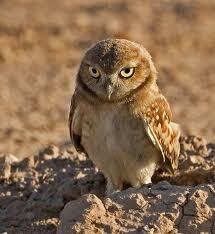 Do a google image search of the Burrowing Owl, and I promise you’ll laugh. These guys are full of character and funny expressions. They eat mostly bugs, and that includes scorpions, too! They also are known to take down rabbits, bats, and other birds, and even eat fruits like the prickly pear – and they are the only species of owl that eat fruit. They’re pretty cool little guys. 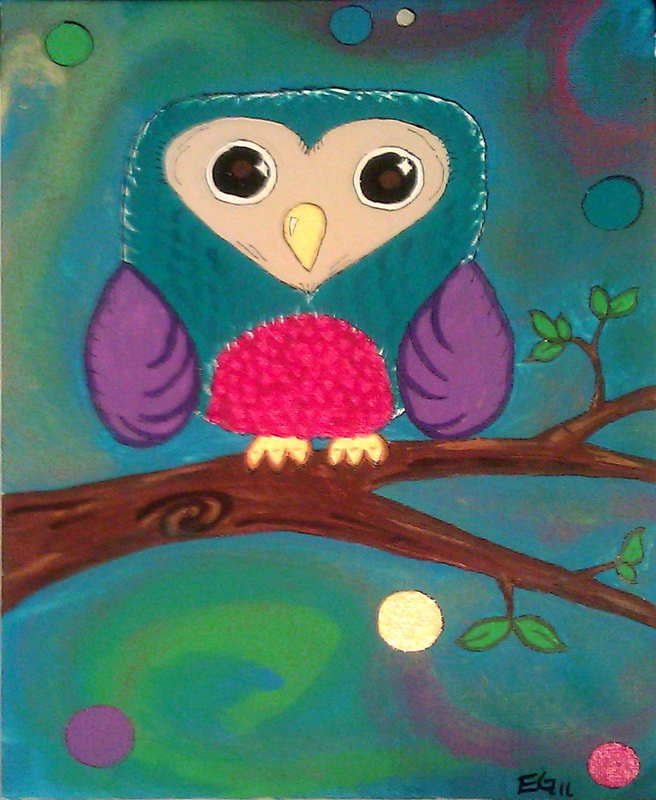 Paige’s Owl was painted for a friend’s daughter to match her very colorful bedroom. This entry was posted in acrylic, animals, art, bird, colorful, kids, owl, painting, pink, polka dots, purple, teal, Uncategorized and tagged acrylic, animals, art, bird, colorful, kids, owl, painting, pink, polka dots, purple, teal on June 5, 2013 by Jumping Jack Studios. The moose is one of my favorite animals, and I’ve been lucky enough to see them in the wild myself on several occasions. The moose is a massive animal – the sheer size of them is something to behold, with 7 feet their average height at the shoulder. The older bulls can grow antler spreads up to 6 feet wide that weigh 90 pounds! Can you imagine carrying around 90 pounds on your head? The antlers grow in at the rate of up to 1 inch per day, and are shed yearly. Another interesting fact – moose have 4 more DNA chromosomes than humans. 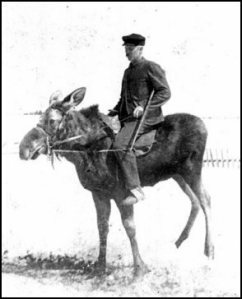 Of the more exotic animals I’d like to throw a saddle on and ride, the moose is up there with the giraffe. 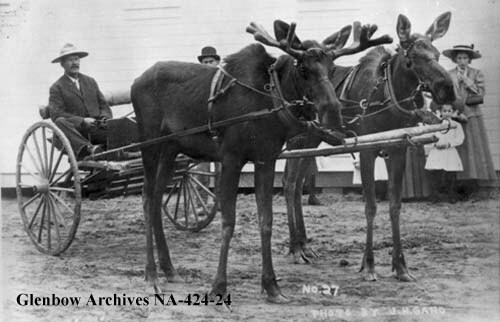 Here and here are some examples of other people with crazy ideas about saddling moose or hitching them up to wagons. The latter seems to be more popular. Either way, moose are spectacular animals, and I enjoy capturing them in my artwork. “Moose in Fall” was painted for and hangs at my parents’ home. 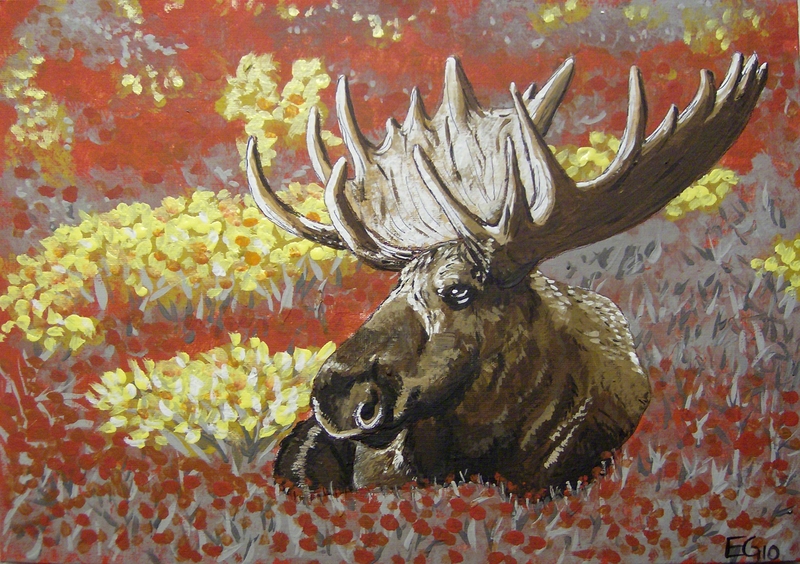 This entry was posted in acrylic, alaska, animals, art, autumn, fall, moose, nature, outdoors, painting, red, Uncategorized, yellow and tagged acrylic, alaska, animals, art, autumn, fall, moose, nature, outdoors, painting, red, yellow on June 3, 2013 by Jumping Jack Studios. “Teton Morning” combines my love for nature and animals. I seem to have a fondness for large, hoofed mammals, as they seem to be up there on my favorites list. I’ve always loved horses, but I also adore moose, and of course, pictured here, the elk (or wapiti…I recently learned from my global postcard swapping that in Europe, the Eurasian elk is actually a moose!). One of the coolest things about elk, aside from their size and incredible antlers, is their call, or “bugle”. I’d relate it to the sound of a whale’s song. Here is a link to a youtube video so you can hear it for yourself if you’ve never heard one before. 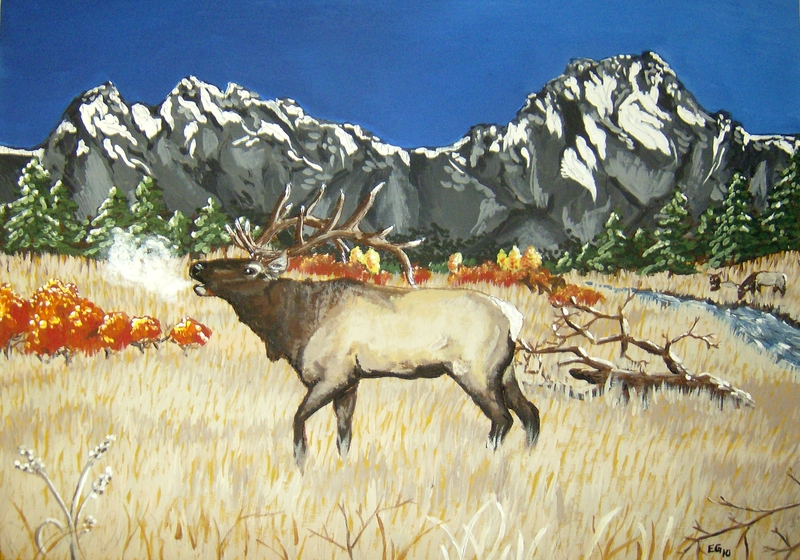 Elk like this are very prevalent in Colorado, and my many trips to the wilderness there inspired this painting. It hangs in the home of a friend. This entry was posted in acrylic, animals, art, elk, landscape, mountains, nature, outdoors, painting, tetons, Uncategorized and tagged acrylic, animals, art, elk, landscape, mountains, nature, outdoors, painting, tetons on May 31, 2013 by Jumping Jack Studios. Don't have a wordpress account? It's cool! Click on the button below to follow my blog via email!